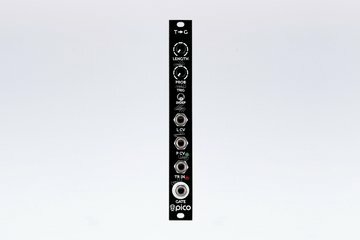 Erica Synths Pico Trigger to Gate module is one of the few modules around that converts triggers to gates using smart algorithms that enhance your musical compositions and rhythm patterns. Erica Synths Pico SEQS is an advanced 4 channel sequential switch with sophisticated control over switching the channels – it combines clock and/or CV signals to advance to the next step and to define the number of steps. Erica Synths Pico LOGIC is a Boolean logic module that allows yout to manage several Gate signals in advanced ways. Erica Synths Pico Envelope Generator brings you a straightforward AR/ASR linear or logarithmic envelope generator and LFO in a 3HP module. Erica Synths Pico Multi is an advanced replacement for stackable patchcables – it is an active buffered multiple with signal status LEDs. 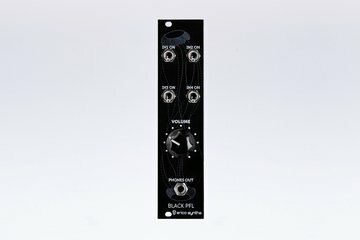 Erica Synths Black 8-splitter is an advanced replacement for stackable patchcables – it is active buffered multiple with signal status LEDs. 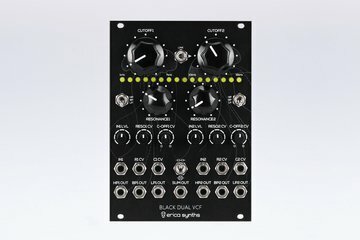 Erica Synths Black Dual VCF is a dual multimode filter with CV control over cutoff and resonance for serious modular patches. 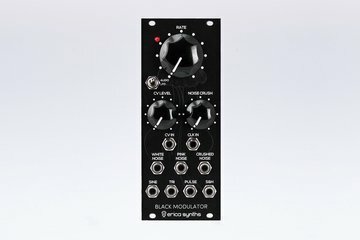 Erica Synths Black Pre-fade Listen Expander is a satellite module for Erica Synths Black Stereo Mixer.